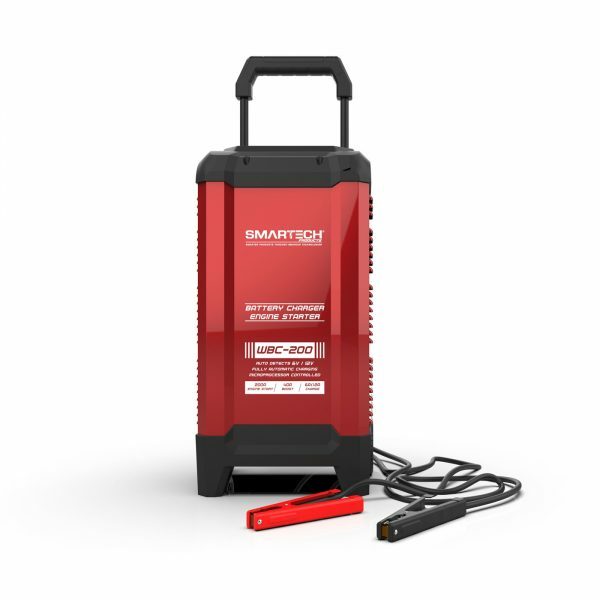 Smartech WBC-250 6V/12V Wheel Automotive Battery Charger, Maintainer » SMARTECH INC.
View cart “Smartech 1A 6-12V Automotive Battery Charger, Maintainer, Repairer, Tester with Advanced Desulphation Process” has been added to your cart. 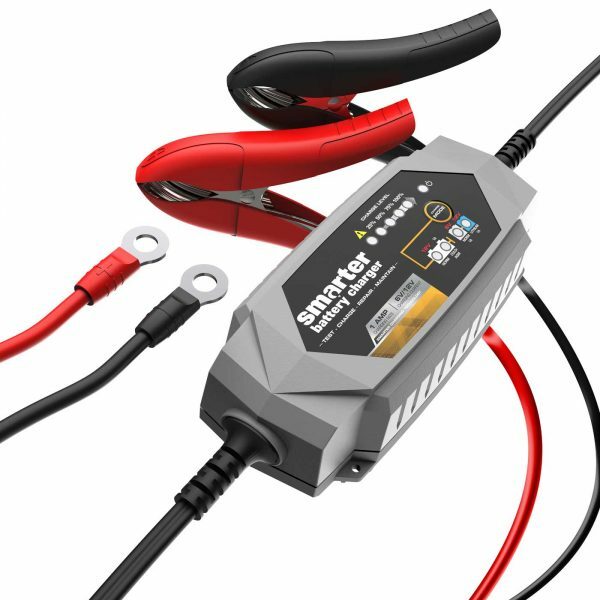 Utilizing a 250 Amp engine start function, you can use this powerful charger to jump start most passenger vehicles or small truck! 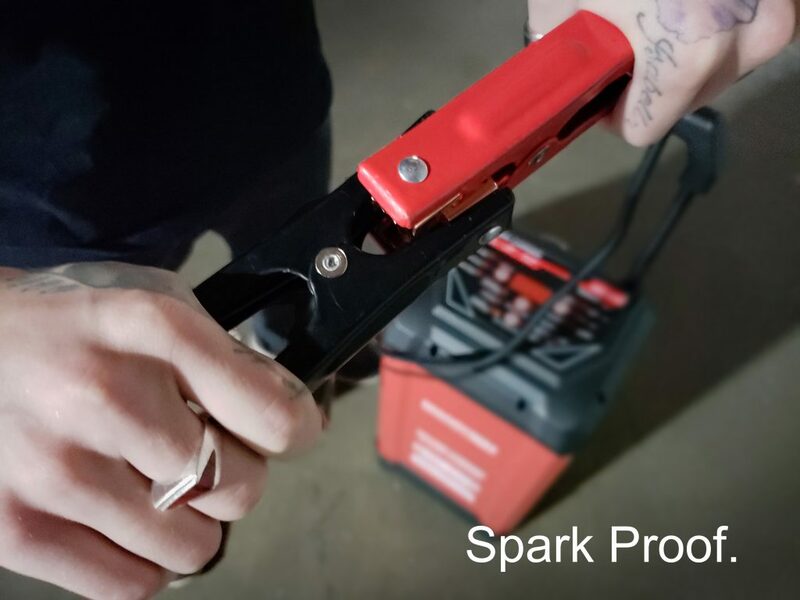 Integrated Safety Features ensure protection for you and your batteries, preventing sparks, overcharging, reverse polarity and more! 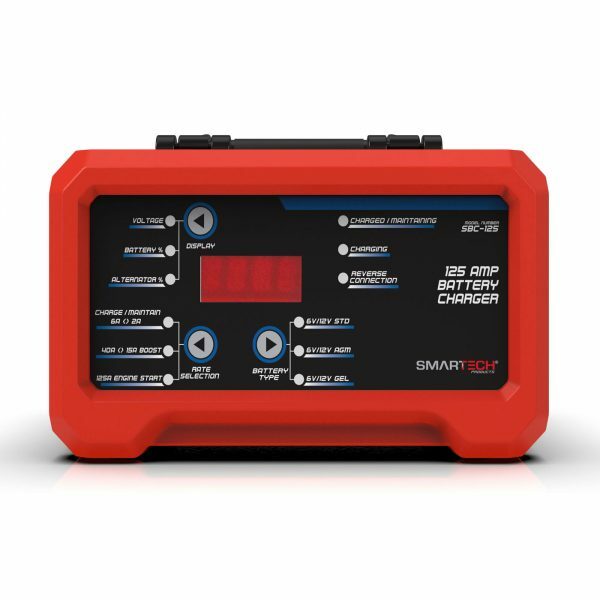 Know the status of your batteries and charge them faster with our integrated voltage tester and 50 Amp boost function. 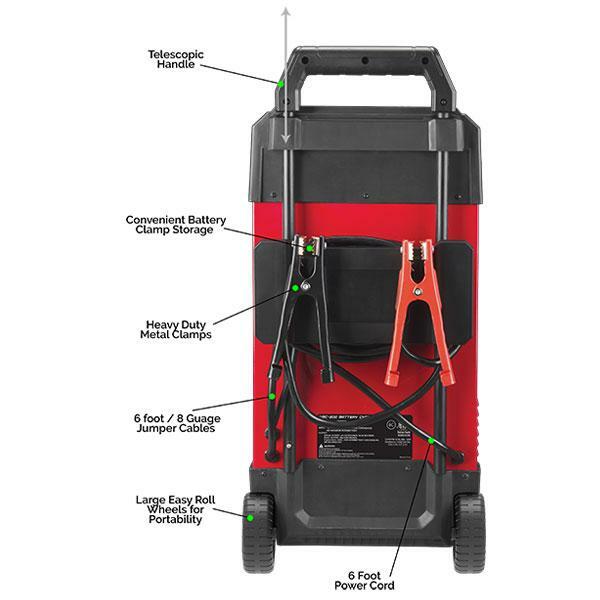 Integrated wheels for easy mobility and collapsible handle for easy storage. 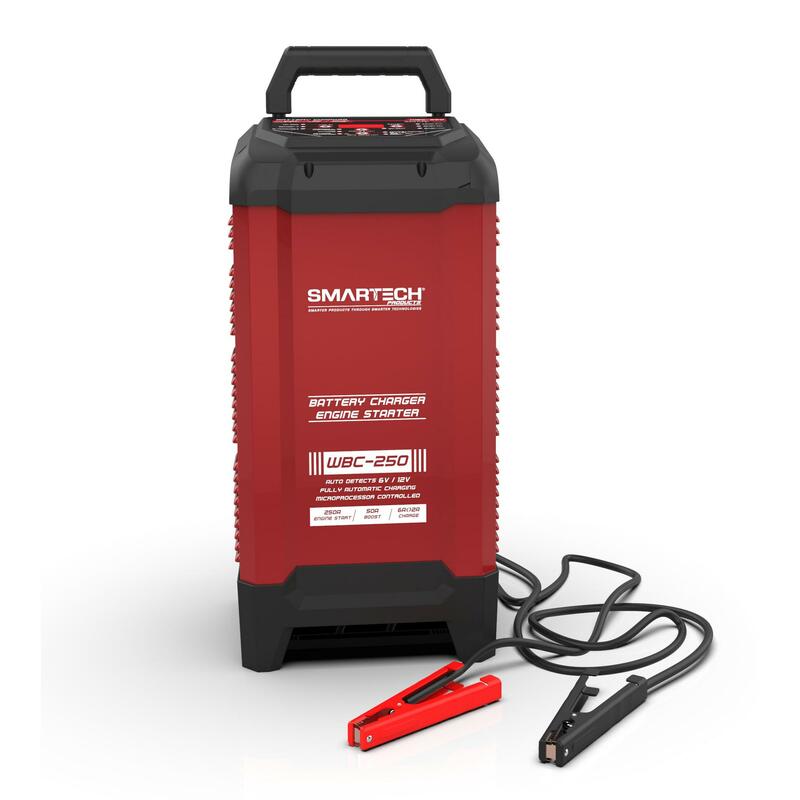 The Smartech WBC-250 6V/12V Smart Automotive battery charger is the no-nonsense solution for charging and maintaining all types of 6- and 12-Volt batteries, including WET (Flooded), MF (Maintenance-Free), EFB (Enhanced Flooded Battery), GEL, and AGM (Absorbed Glass Mat). 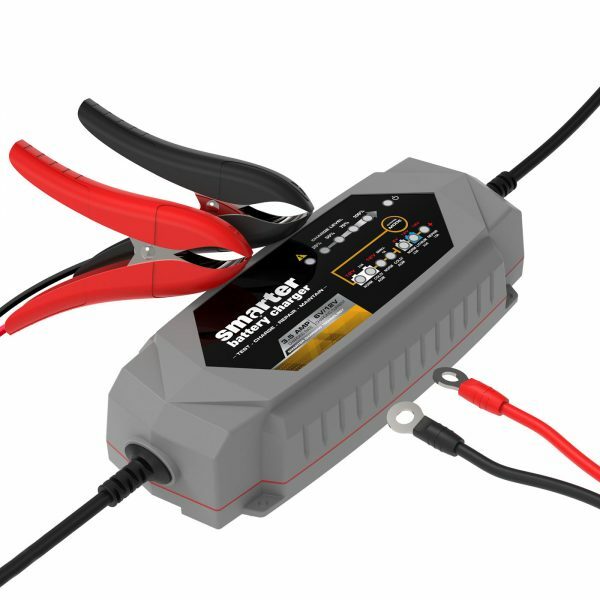 It even has a built-in microprocessor that makes charging faster, easier, and safer to use. 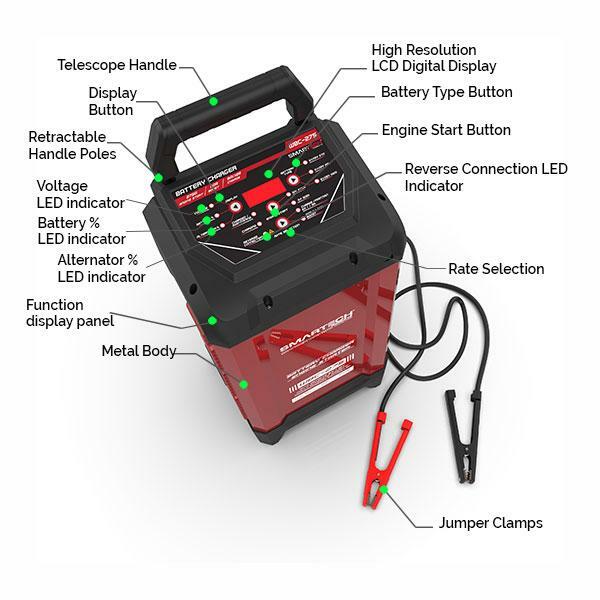 The WBC-250 6V/12V Wheel Battery Charger is capable of testing, charging and maintaining all types of 6V and 12V lead-acid batteries, including WET (Flooded), GEL, MF (Maintenance-Free), EFB (Enhanced Flooded Battery), AGM (Absorbed Glass Mat), and 12V Lithium and AGM+ batteries. It has a built-in intelligent microprocessor which makes charging faster, easier, and safer to use. 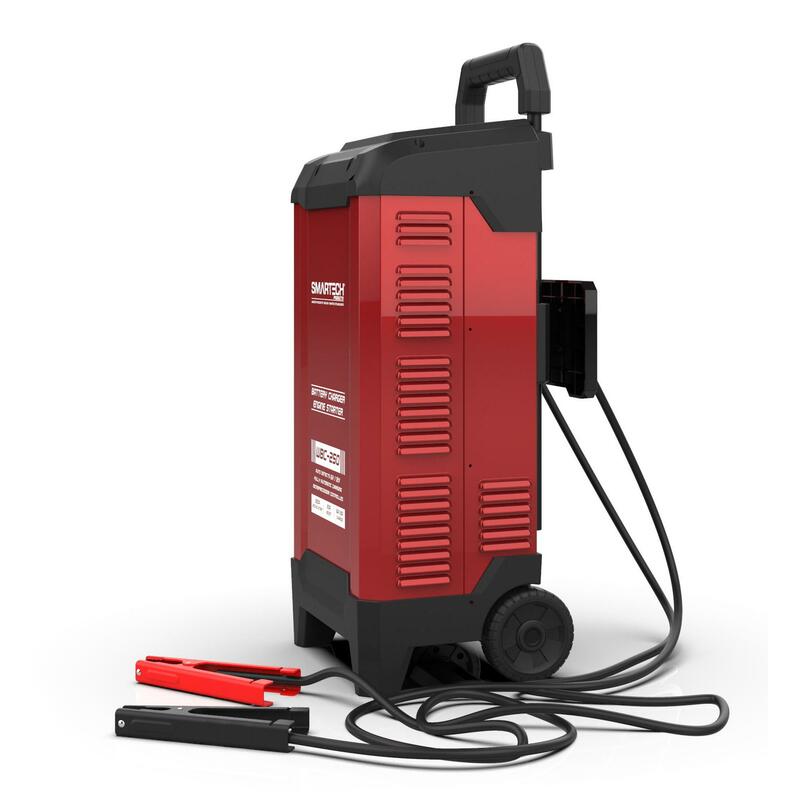 Safety features include spark proof, reverse polarity, short circuit, over current, overcharge and overheat protection. Keep it connected 24/7 without damaging the battery and keep your battery ready to use. 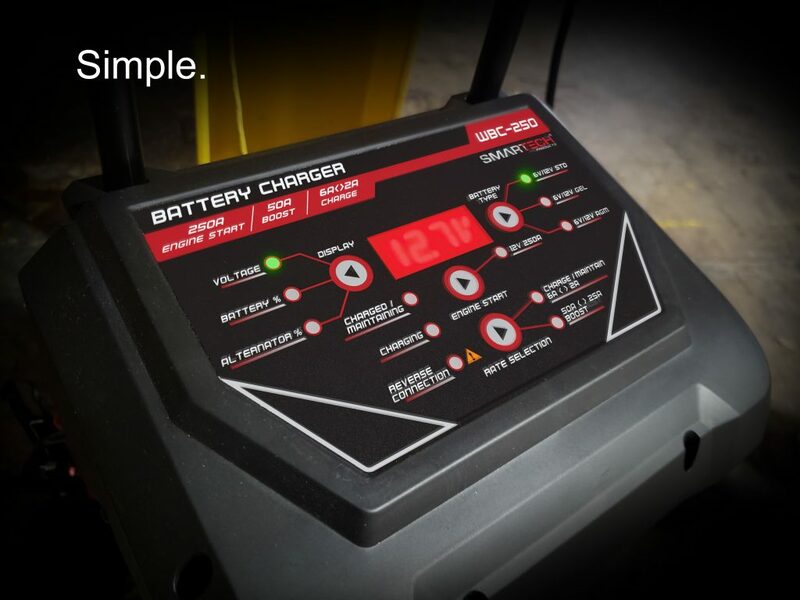 Our WBC series is equipped with a 250A engine start mode, which allows the user to jump-start automotive engine batteries, and can be left safely connected for maintenance using our 6A trickle charge feature. Two unique but convenient features included on our WBC series are the 50A boost feature and the alternator check function. 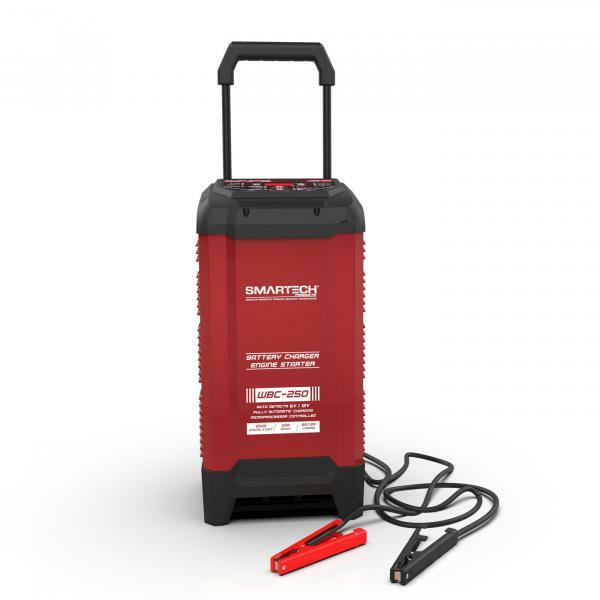 Our 50A boost will charge standard batteries more quickly if the user is in a hurry, and it is possible to check the status of your automotive alternator simply by hooking it up to your vehicle and following the instructions in the user manual. 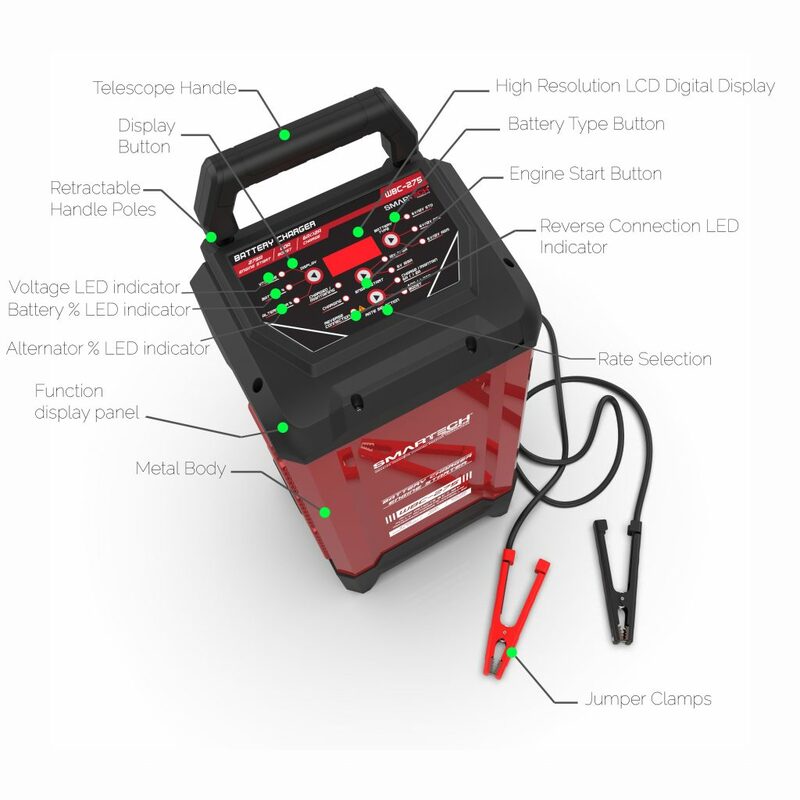 The WBC-250 has a variety of built-in safety features, such as spark proofing, protection for reverse polarity, short-circuiting, overheating, overcharging and overcurrent, the WBC-250 provides an efficient and easy to use a battery charger that will always have your batteries in top performance condition. 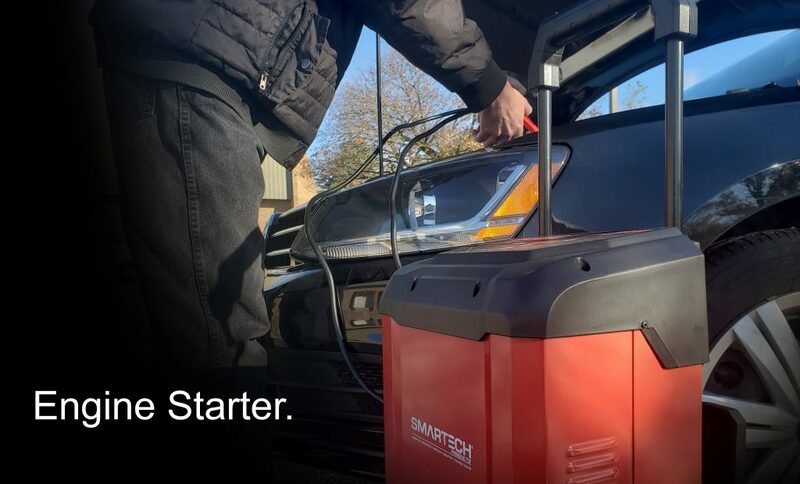 Not only does the WBC-250 Smart Battery Charger charge and maintain automotive batteries, it can double as a 12VDC 250A engine starter, meaning it can jump your vehicle the same way you would normally jump start a vehicle but without the hassle of pulling out a separate device. Not only that, but the WBC-250 is equipped with a boost function that supplies an extra 50A power burst to charge low batteries even faster. Our shelf chargers are built to ensure that even an accidental mis-connection wont cost you money or property. Smart Protection to keep you safe. 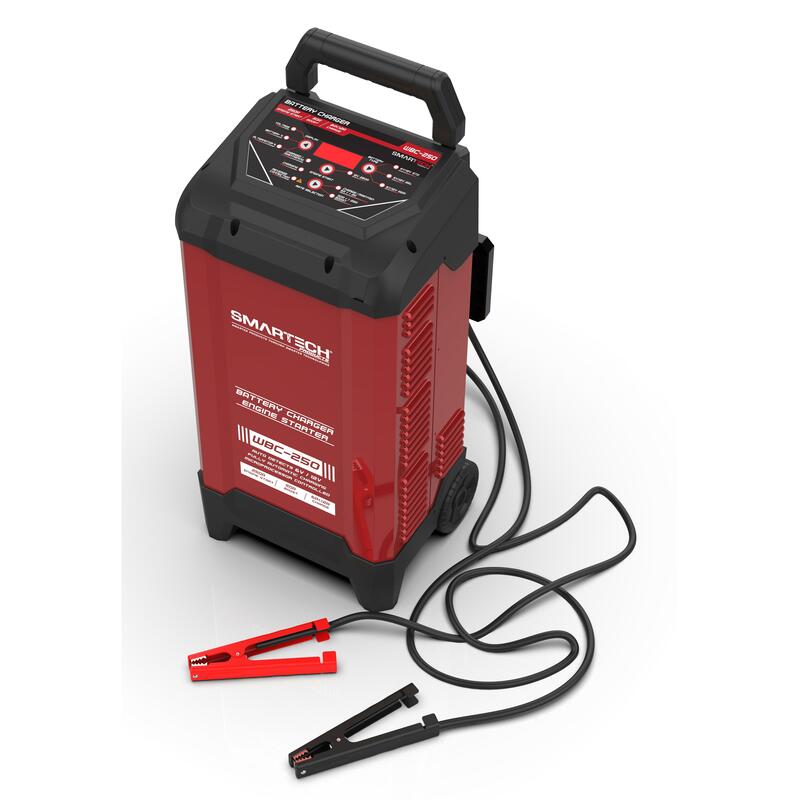 A unique feature included in our charger is an Alternator Check Function. Once your charger is hooked up to your vehicle battery, all you have to do is start your vehicle and turn on the headlights and the display will show the voltage, indicating the condition of the alternator! The WBC-250 Smart Battery Charger comes standard with a 6ft power cord and 6ft cable set, allowing for 12 feet of mobility from an outlet to the battery. We outfitted the WBC-250 with several external features to ensure ease of use despite its awesome power output capabilities. 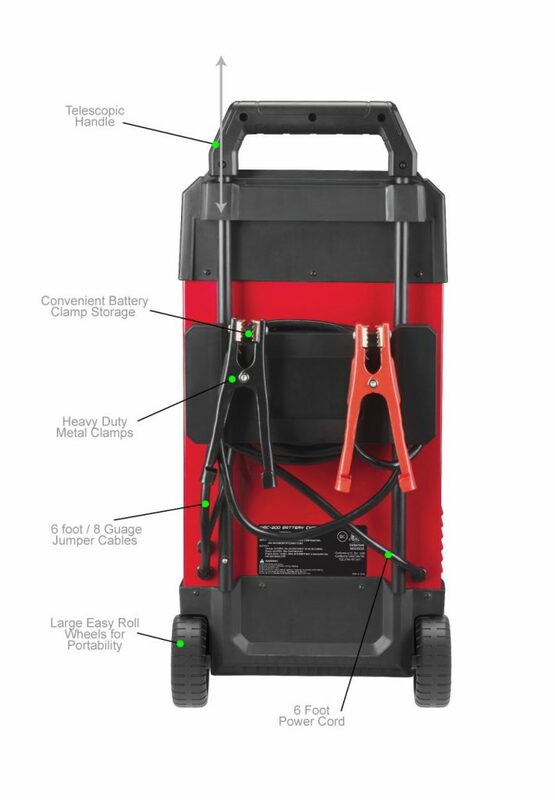 We have a built-in retractable handle for mobility, as well as our simple yet durable easy-roll wheels and clamp mounts for hassle-free portability and storage. The control display for the WBC-250 is easy to understand and straightforward to use, with a digital readout and clearly labeled mode selection buttons. 120VAC, 60Hz, 11.5A Maximum continuous, 50A MAXIMUM INTERMITTENT.